England women will wear a specially designed kit for this summer's World Cup - the first time they have had one different to the men's team. The SheBelieves Cup winners will debut the home kit against Canada at Manchester City's Academy Stadium on Friday, 5 April. 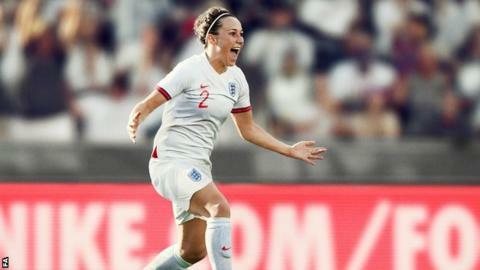 "It is great to see kits designed specifically with us in mind," said Lionesses forward Fran Kirby said. "The home kit seems really classic, while the pattern of the away is exciting and new." Baroness Sue Campbell, the Football Association's director of women's football, said: "It's the first time our women's team have had their own unique and exclusive kits, which is a real marker of progress and an indicator of how much the profile of the women's game has grown in this country." The Women's World Cup begins in France on 7 June, with Phil Neville's Lionesses in a group with Scotland, Argentina and Japan.